Less than two years after the first report of wild chimpanzees in Uganda dying as a result of a human “common cold” virus, a new study has identified two other respiratory viruses of human origin in chimpanzee groups in the same forest. 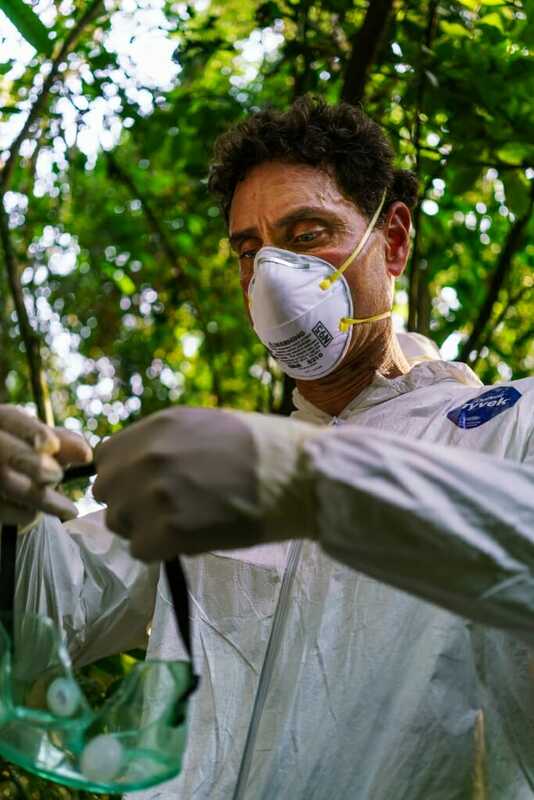 Writing this week (Jan. 17, 2019) in the journal Emerging Microbes and Infections, a team led by Tony Goldberg, a University of Wisconsin–Madison professor in the School of Veterinary Medicine and an expert on emerging pathogens in animals, describes two simultaneous outbreaks of respiratory illness in chimpanzees in the wild, one of which was lethal. Goldberg is also associate director for research at UW–Madison’s Global Health Institute. The outbreaks affected different chimp communities in the same forest at the same time, between December 2016 and February 2017, prompting suspicion that the outbreaks had a common cause. One group, consisting of 205 chimpanzees known as the Ngogo community in Uganda’s Kibale National Park, was especially hard hit, with almost 44 percent of the animals in the group suffering from respiratory illness. Twenty-five chimps in the Ngogo group died during the outbreak. The other group of chimpanzees, knows as the Kanyawara community and consisting of 55 animals, experienced an outbreak where a little more than 69 percent of animals were affected by respiratory illness. In contrast to the Ngogo group, no animals from the Kanyawara community died of the disease. In both instances, scientists caught a break through the quick recovery of the bodies of deceased chimps for post-mortem exams by veterinarians, allowing for “a rare direct comparison. A dead individual from the Ngogo group, a 20-year-old female, showed evidence of sudden viral illness. A 22-year-old female chimp from the Kanyawara community had been ill but was recovering when she was killed by members of her group for unknown reasons. Her body showed evidence of a more prolonged disease course, according to the new report. Viral genetic material from the Ngogo chimps revealed infection by metapneumovirus, which is known to cause deadly disease in chimps across Africa. Surprisingly, the Kanyawara chimps contained the genetic material of a different virus, parainfluenza virus 3. Parainfluenza virus 3 is a common cause of croup in preschool children. In people, metapneumovirus (MPV) is a common cause of “wheezing illnesses” in infants, explains James Gern, a co-author of the new study and a professor of allergy and immunology in the UW School of Medicine and Public Health. Goldberg and Jacob Negrey, first author of the paper and a Ph.D. student at Boston University, were both on site at the time of the outbreaks. 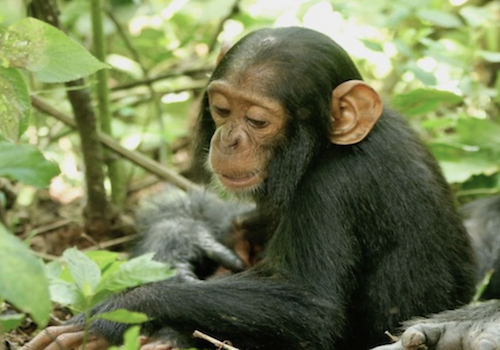 One infant chimp at Ngogo cried for hours after her mother died from the illness, Goldberg says. The baby clung to her mother’s body before finally wandering off to find the rest of the group. According to Goldberg, a human origin for both viruses can be inferred because the viruses in the chimps were nearly identical genetically to common strains found in people. A group led by Goldberg was the also the first to identify another human cold virus infecting and killing chimps in Uganda in late 2013 – rhinovirus C.
Outbreaks such as these are common in wild African apes and metapneumovirus has been a common culprit. Although people are the sources of these viruses, it is not clear how they are getting into chimps. Governments and conservation groups across Africa are working to avoid similar outbreaks. Current regulations include quarantine periods for people entering the forest, the use of face masks and hand sanitizers, and strict policies about distances that tourists must keep from apes. This story first appeared at news.wisc.edu. Feedback, questions or accessibility issues: agrauvogl@wisc.edu.